Council Officers have written to Eltham’s Councillors about the arrangements to complete High Street works around the new Eltham Cinema over the next few months. Because of the hoardings and Cinema works programme, Officers had advertised well in advance (and retained some funds) to complete an element of the Eltham High Street Major Improvement Scheme after the opening of the new cinema. 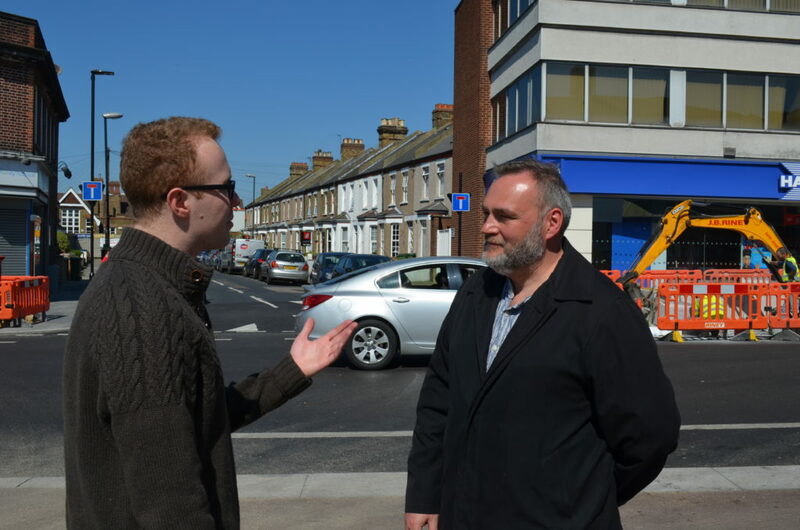 At the Eltham Town Centre Management meeting in St Mary’s Community Centre on Tuesday, it was possible to see that, as the Cinema has neared completion, the highway works around the outside have been completed. In addition, two final elements of high street work now need completing: the new crossing to the west of the cinema needs building and the pavement will be widened opposite the cinema. The new crossing is the site of the “courtesy crossing” as proposed in the original plans, but following discussions with local residents, the Council has made a submission to TfL to see whether it could be upgraded (to a zebra or green-man controls). Temporary traffic lights have been in place at the crossing point since the start of cinema construction – mainly due to visibility issues around the hoarding. Unfortunately, as the hoarding is removed the temporary traffic lights will also be removed. A temporary traffic island at the courtesy crossing will be installed to reflect the original agreed design. This arrangement will remain in place until the construction of the agreed new crossing has been completed (either as the original courtesy crossing or a controlled crossing) – perhaps a couple of months. The pavement works on the opposite side will start later this spring (after the cinema has opened) with a short break to avoid road works starting immediately following cinema opening. Works on the road at the end of Roper Street have been a problem for residents for some years, so we can hope that the completion of the cinema will finally end this chapter for them. We are grateful to Council Officers for keeping us informed, but if residents have any views on any of these issues, please do get in touch with one of Eltham’s Councillors.